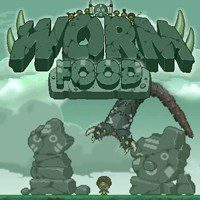 You will play as the huge worm, who wants eat everyone. Use arrow keys to move and kill all humans here. They though that this terrible warm is dead, but they were wrong. The life of humans depends on you... Kill them all! A thousand years ago the warriors of the stone tribe fought against an ancient and deadly creature and defeated it. They believed they had destroyed evil itself and had more mere need for their gods of stone. Use the left and right keys to turn the worm, up key to accelerate and down key to slow down. Build up to the top speed to jump and reach higher places, avoid obstacles as they will slow you down. Complete the levels by devouring all villagers on the screen. The mini map will show you where the villagers are on the level and also dangerous objects to avoid.